Magnifica has the power to produce and manipulate force fields. She can also fly and move at high velocities. Charlotte was nine years old when she suddenly discovered she had the power to produce and manipulate force fields. She and her younger sister, Francine (whose powers also manifested that night) awoke to the sound of her father screaming in agony. They ran into his room and in an attempt to provide comfort, Charlotte put her arms around him and hugged him. But he continued to cry out and grab his head as if something was stabbing his brain! She squeezed harder and after a few minutes he finally fell silent. The only problem is that he had fallen permanently silent. Charlotte would soon learn that when she hugged him, she had inadvertently enveloped her father in a force field and the harder she squeezed, the more it contracted around him eventually suffocating and killing him. This incident absolutely destroyed Charlotte emotionally and propelled her and her sister into the foster care system, as their mother had disappeared years ago when they were 4 and 2 years-old. They bounced around to different families and group homes all over the United States. They never stayed in a place for more than a few months, but remarkably, were also never separated from each other. At the age of 17, Charlotte and her sister found themselves in the care of a middle-aged couple named Vivian and Carlos Valenzuela. The girls were only there a few weeks before they began making plans to run away. However, when they learned that their new foster parents had powers as well, they decided to stay. Vivian and Carlos introduced themselves as Ebb and Flow, respectively. Ebb had the ability to momentarily mute the powers of other super-powered beings (making adversaries more easily susceptible to her expert martial arts skills) and Flow possessed the ability to temporarily enhance the powers of others (which works very well in tandem with his mind-control powers). 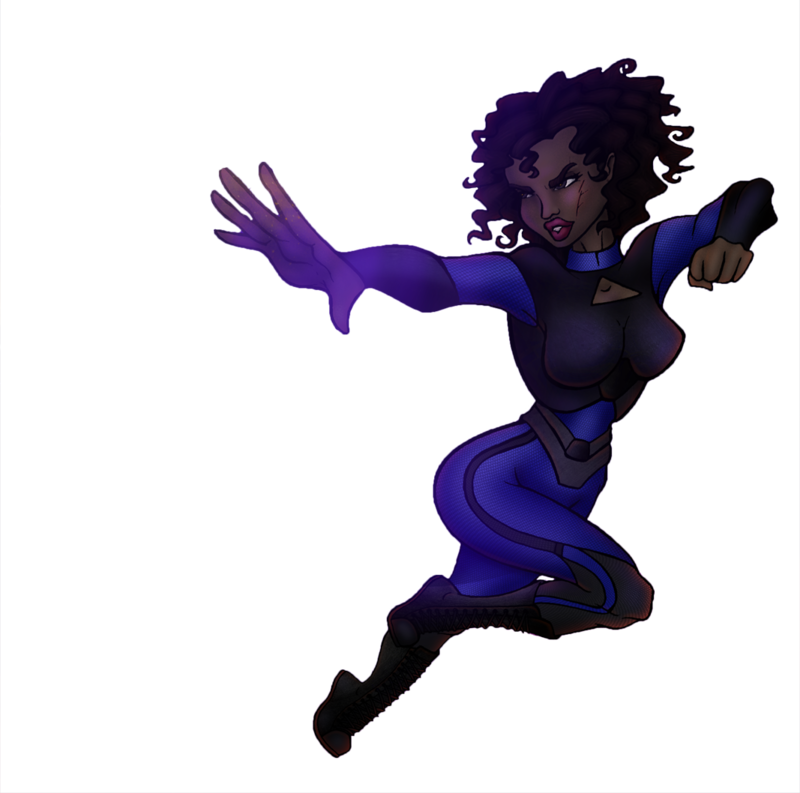 Ebb and Flow were also amazing teachers and began training the girls in how to optimize their own powers. While Francine immediately took to the training, Charlotte resisted it for a while, as she still felt the burden of guilt for her father’s death. But she eventually came around and came to believe that she could use her powers for good. After nearly two years of the training with Ebb and Flow, Charlotte rechristened herself “Magnifica” and went out into the world as a hero for hire. She worked as a vigilante for a while, taking down several super-villains here on earth. But when she learned that her powers enabled her to fly and breathe in outer space, she became an intergalactic hero. She soon recruited others and formed an interplanetary hero squad. The mighty King Ka’Desh, who was thought to be the last survivor of the Planet Mederia, became her first recruit. He had been living a reclusive life in a small town in Southern California when he was suddenly forced to use his powers to save civilians from a chemical fire in his apartment complex. This caught the attention of Magnifica who immediately made contact and convinced him to come out of hiding. Before long the two of them united with four other extraordinary beings, Twinstar, Utopia, Mr. Amazing and Thundersnow and they became the Diamond Alliance. In one of their first adventures, Magnifica and her team traveled to Kepler-444e, the fourth world in a small star system, nearly 117 light years away from earth. The planet is home to approximately 800,000 Keplarians, a race of humanoid beings who had evolved to withstand the extremely high temperatures of their worlds. But because of a shift in the gravitational polarity of their host star, Kepler-444e and its 4 sister planets were beginning to drift into wider orbits, causing a drastic drop in temperatures. In a desperate attempt to save their world, the leaders of Kepler-444e attempted to unleash the heat within the core of their planet, but instead caused a chain reaction that threatened to destroy them all. The Diamond Alliance arrived just in time and Magnifica was able to produce a force-field around the core that contained and stabilized it. Then she and her team used their myriad of powers and abilities to shift the planets and re-establish safe orbits, saving everyone in the Kepler planetary system. It was after this mission that Magnifica proved to be one of the greatest team commanders in the universe as the other members of the Diamond Alliance pledged their loyalty to her. Despite her status as a supreme hero and a respected leader, Magnifica struggled her entire life with the guilt of killing her father and the mystery of her mother’s disappearance.